Who’s gonna win this Tic-Tac-Toe battle? Well, it’s up to you because crosses and circles come separately and can be easily installed the way you want. 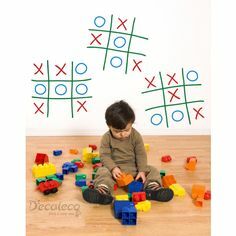 Decorate your kid’s room with this set of 3 Tic-Tac-Toe games. Choose three colors for the grid, circles and crosses designs. 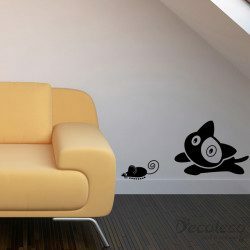 This wall decal is available in 24 colors and comes in 2 pieces (as shown in picture). Feel free to cut the decal and arrange the layout of the decals to suit your taste.